If you’ve had a denture for a long time, you’re probably aware of the burdens that can come with it. Whether it’s a partial or full denture, they never seem to feel quite as natural as they could. That’s where implant-retained dentures come in. This restoration is unlike any other traditional denture because it works in tandem with dental implants. 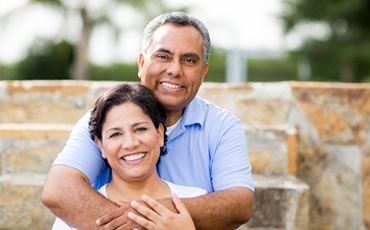 If you wish your restoration was more reliable or simply needed to try something different, don’t hesitate to contact Dr. Patel and Dr. Calhoun at the Dental Center in Jacksonville! There are two main types of implant-retained dentures to consider: bar-retained and ball-retained. Bar-retained dentures are supported via a metal bar that follows the shape of your jaw. 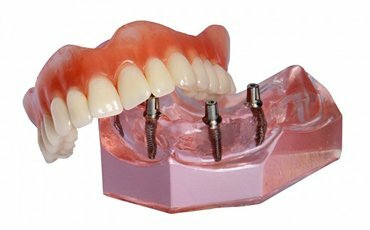 It is attached to two to five implants and clips onto other attachments which are fitted to the metal bar, the denture or both components. Alternatively, a ball-retained denture uses studs that stick out of the gums for the denture to snap onto. The denture is custom-made with holes that connect on top of each implant. The implants themselves are typically ball-shaped, hence the name. 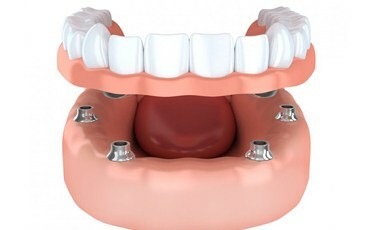 In some cases, the ball attachments are connected to the denture itself, while the snap-in holes are on the implants. Candidates for implant-retained dentures are more than likely missing all of their teeth, but not in all situations. However, those who have been missing their teeth for an extended period of time will likely need to undergo additional surgery to expand their current bone volume. One of the most important steps of treatment is planning. Our dentists will confirm the state of your jawbone before beginning treatment. This will confirm if the implants will effectively integrate with your existing jaw or not. If not enough bone is available, a bone graft can be performed to expand its surface area for better integration. The process for implant-retained dentures consists of four parts: consultation, first surgery, second surgery and the initial insertion. During the consultation, your oral health will be reviewed and we’ll work with a prosthodontist who will create your customized denture. Planning typically consists of X-rays and impressions, which are used to help create the actual denture. The first surgery involves placing implants into the jawbone and covering it with a temporary denture while it heals. Over the next three to four months, the implants will be given time to heal. During the second surgery, we’ll reopen the gums so a healing cap can be placed on top. This makes sure that the gums heal correctly around the implants. After two more weeks of healing, we’ll replace the healing caps with abutments and an impression will be taken. 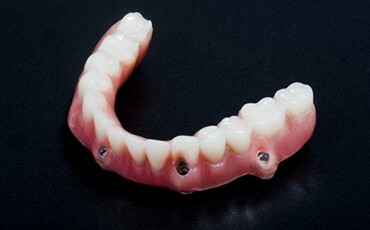 This final impression will be used to create your permanent denture. Implant-retained dentures integrate with bone, which means the functions you previously lost should begin once again. That means your biting force will be stronger and your face and jaw should retain its natural shape.